I finally got around to trying out Netflix’s (no longer) new Watch Instantly feature. It’s a pretty cool setup considering I’ve already had Netflix for several years. With my current plan of three DVDs at a time for $16.99 a month, I get an unlimited number of hours of Watch Instantly movies. That’s a pretty sweet deal. The only problem…It’s Windows only. Even worse, It’s IE only. That has pretty much been a deal breaker for me so far. I have a PC at home, but I don’t ever want to sit at my desk to watch a movie. My laptop is a MacBook Pro. I do have Boot Camp, but the whole rebooting thing has kind of turned me off in the past. Earlier this week I installed VMware Fusion, which works with my previously installed Boot Camp Windows partition. I finally decided to try out the Netflix Watch Instantly. After spending about 15 minutes jumping through an unbelievable number on installations, run anyway dialogues, yes I really do want to do that thing I just told you to do, one restart, and one unexpected Internet Explorer error later, I was up and running. I have to say, it looks really good. The interface is very nice (very Mac-lke actually) and the quality is excellent. I was able to put the show into fullscreen and it still looked good. One concern that I do have though is that I’m actually at work running this over their ridiculously fast internet connection. So, good quality with no buffering issues isn’t saying much. I’ll have to reserve further judgement to see how it works on the wireless connection to my DSL modem I have at home. Open your Window Media Player, go to Tools -> Options, click the “Privacy” tab, and make sure “Download usage rights automatically when I play or sync a file” (should be the third option from the top) is checked. 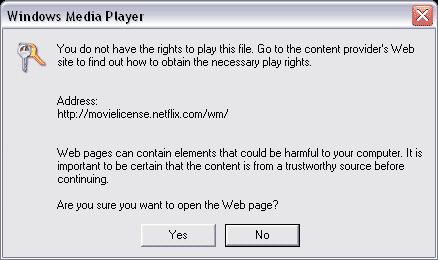 This will prevent the annoying “You are not authorized” dialog from popping up EVERY S-I-N-G-L-E T – I – M – E you play a movie. I finally got a chance to try out your tip. It works great! It was driving me nuts to get that dialogue for every single movie or TV show. I didn’t realize there was a preference for that.